I’ve been remiss not reviewing one of my go-to smokes the Papa’s Fritas from our friends at Drew Estate. Made from the same tobaccos as the Liga 9 series, this stick has a mix of short and long fillers. That is, I suppose, part of how they keep the price down, using leftover leaf from the larger, higher priced, cigars. The cigar is 4.5″ long by 42 ring. Nice and firm all the way around. Dark slightly oily wrapper with some dark/light color variation that shows the seams. Cold smell gives off earth, a little barnyard, and tobacco. The cap has a prominent tail. I’ve noticed when I cut these the cap tends to come off and the wrapper starts unrolling. It seems the best way to open these is to look at the direction of the twist in the tail, grip it, and twist in the same direction while holding onto the cap. You get a neat little hole giving a perfect draw. Sometimes the cap comes off as you smoke, but the wrapper doesn’t unroll. It helps to moisten the cap before you do this. The smoking experience is nothing short of wonderful. Medium in strength, full in flavor. So many flavors come in and out. There is only a little pepper and lots of earth, wood, leather, some coffee, and roasted nut. As you smoke along the earth tones down and a sweetness like brown sugar comes up. Pepper stays mild throughout. The cigar produces lots of creamy smoke and the burn line stays even. I’ve rarely had to correct one of these. I think having some short filler actually helps here. Draw is perfect for me and stays consistent throughout the smoke which goes a consistent 55 minutes, sometimes more. The stick stays flavorful down as far as you can smoke it without burning your lips. While their appearance is a little rough I like that, and there is nothing rough about the way it smokes. The Papa’s Fritas originally retailed around $6/stick, but these days, if you buy at the box level (50 cigars/box), you find them around $4.50 even without any discounts. Using some of the standard discounts from places like Famous, you can get them for about $4.15/stick. Although this is not my absolute favorite cigar it’s up there in my top 10, maybe even my top 5. As goes bang for the buck I can’t think of a single stick that beats this one. 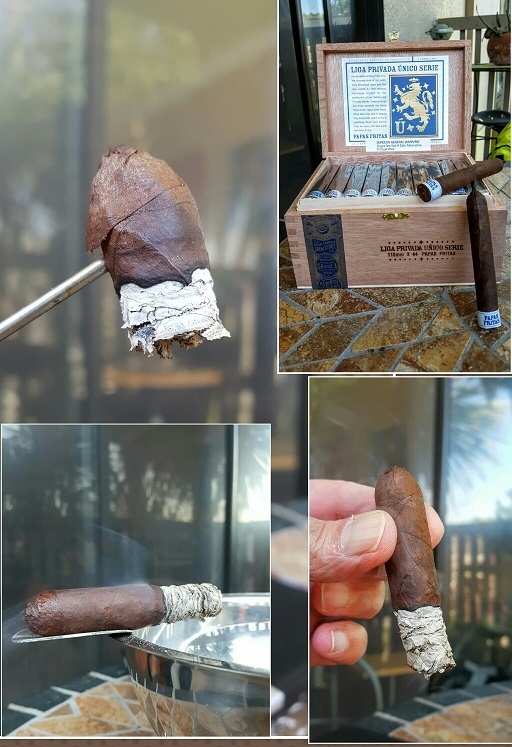 This is one heck of a great cigar for its price. Highly recommended!